JT Window Tinting offers tinting for office windows across Southern California. Window tinting film will allow offices in Los Angeles, California to stay cooler in the summer and warmer in the winter, making your employees more comfortable. Less glare from outside means better visibility for computers. Glare causes eye fatigue and lower productivity. Closing blinds causes a claustrophobic feel and increases the cost of lighting. Window tinting films let in the light but not the glare. Window tinting reflective film can keep out as much as 80% of the sun's heat, substantially lowering air conditioning costs. In the winter, the same film retains interior heat, dropping the cost of heating. By allowing you to leave blinds and curtains open, you save on artificial lighting. We have over 40 colors and densities of commercial grade films. It will be simple to find one that will match your requirements and still look attractive enhancing your building's style. 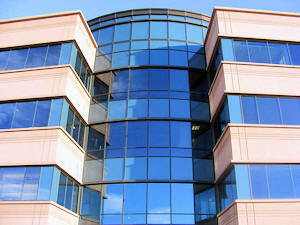 Window tinting films make building exteriors more attractive and modern. Commercial window tinting films are designed to hold broken glass in place in the event of storms, vandalism or disasters. This decreases the chance of injury and property damage from splintered glass. The added strength to the window also helps prevent vandalism. Far too many business owners fall victim to vandalism. They know the pain and frustration of finding graffiti on their property. Not only does graffiti affect the business aesthetics but it’s also expensive damage to mitigate. Often a business is forced to bear the brunt of replacing glass windows marred by vandalism, and this undue expense can costs many thousands of dollars. Anti-graffiti window film is a great way to prevent glass from being damaged. Anti-graffiti film will protect all types of glass against etching, gouges, scratches, acid marking, and spray paint. The cost of anti-graffiti film is but a small fraction of the costs associated with replacing the actual glass; it is much easier and far less expensive to replace sheets of window film than it is to replace your glass windows, mirrors, or doors every time they are damaged. The film acts as a “sacrificial” layer; in an event of vandalism or other damage, the glass panes themselves will not be damaged, all that would need to be replaced is the window film. Get in touch with the window tinting experts at JT Window Tinting for a free estimate or for more information on the commercial window tinting services we offer across Southern California.